** TRIGGER WARNING ** The novel is set in a psychiatric hostital, and explores the lives and experiences of severely mentally ill patients who have been admitted to the hospital. Includes references to self-harm and suicide. Contains repeated references to a brutal murder, and explores all the grizzly details of the crime. Explores the theme of addiction, including drug abuse and alcoholism. Contains references to childhood abuse, including physical and emotional abuse. Contains scenes of a sexual nature and explores the issue of infidelity. 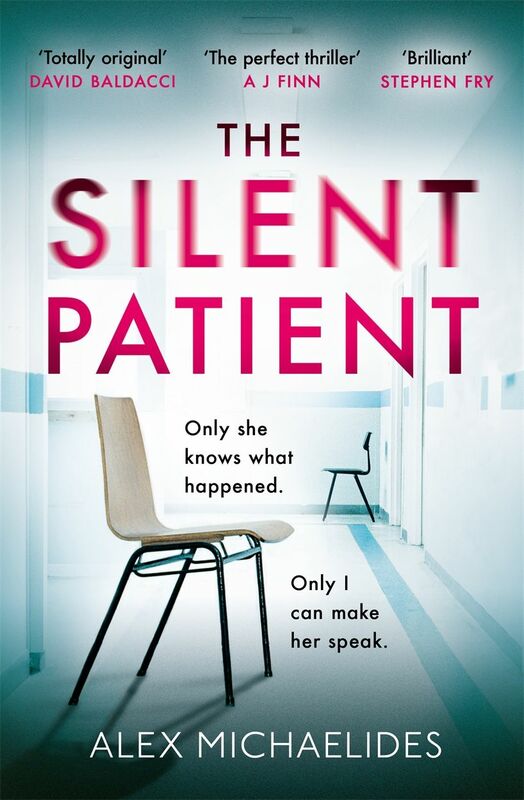 ‘The Silent Patient’ is Alex Michaelides’ debut novel, and is due to be released on 7th February 2019. The book is also being developed into a film by Brad Pitt’s production company, Plan B. Michaelides was born in Cyprus and worked as a film writer, working on films such as The Devil You Know and The Brits Are Coming. He studied a post graduate course in psychotherapy and worked part-time at a secure psychiatric unit for two years. The novel is mostly narrated from the first-person perspective of Theo Faber. The reader is given an in-depth insight to his thoughts, feelings and emotions as he continues to treat Alicia. The novel also contains some diary entries, written by Alicia herself. These narrate the past experiences of Alicia, leading up to the night in which she murdered her husband. The narrative is very easy to follow, but is still very effective. Theo is my favourite character in the novel, which is not surprising considering he is the character we learn the most about throughout the novel. At first, he appears to be an extremely thorough and intelligent psychotherapist, who has come to The Grove simply to help Alicia. As a child he experienced abuse and later on in life his mental health suffered, and he wishes to help those who are also unwell. He is having some personal difficulties throughout the novel, with his marriage to his wife Kathy proving difficult, and his own addiction to drugs begins to take over. It soon becomes clear that there is more to his character than first meets the eye, and there is a whole other side to his personality. He is a very realistic and three-dimensional character. Alicia Berenson is a troubled individual who also has experienced abuse as a child. She is an extremely talented artist, who uses art to express her inner feelings and emotions. She loves her husband Gabriel deeply, and would do anything to make him happy. Their relationship is rocky and unconventional, but there is nothing apparent that would motivate her to murder her husband. In the present day, Alicia refuses to talk and she is full of rage and sadness, and she seems to have completely given up on life – until the day that Theo walks through the door. I felt a great deal of sympathy towards Alicia, as she really has experienced some great hardships in her lifetime. Gabriel Berenson adores his wife Alicia, and again, would do anything to make her happy. Their relationship suffers when Alicia becomes busy with her work, and Gabriel wants nothing more than to have Alicia all to himself. He’s jealous and sensitive, and he overthinks everything that his wife does or says. Gabriel is also a very troubled character, and seems deeply sad at times. He’s controlling and also has his own struggles with addiction. Gabriel was quite a well-written character, although nothing special in my opinion. Other characters in the novel include: Kathy (Theo’s wife), Ruth (Theo’s therapist), Yuri, Christian, Professor Diomedes & more (Theo’s co-workers at The Grove), Elif and various other fellow patients at The Grove, and various members of Alicia and Gabriel’s families and their friends. The cast of characters is relatively small, and all bring something fresh and exciting to the novel. ** TRIGGER WARNING ** (I apologise for any spoilers here.) The novel is primarily set in a psychiatric hospital, and naturally documents the patients’ and workers’ experiences of being in such a setting. The patients are severely mentally ill and suffer from some complex illnesses, and these are explored in great detail in the novel. The novel touches on aspects such as violence, self-harm and suicide. The novel is centered around a brutal murder, and works to uncover all the grizzly details of such a violent crime. The theme of addiction is explored in great detail, particularly in regards to alcoholism, substance abuse and drug abuse (frequent marijuana use). The novel contains references to childhood abuse, including physical and emotional violence. This abuse is explored in relation to two central characters in the novel. Finally, scenes of a sexual nature are included, and the theme of infidelity is explored in some detail. All of these issues are dealt with in sufficient detail and with appropriate sensitivity, but if any of these may trigger a negative response, I suggest you skip this book. As the narrative motors onwards, the truth about what happened that night seems to drift further from Theo’s reach. Just as Theo believes he is making progress with Alicia, another obstacle appears and he is forced to take a step backwards. She begins to make some attempts to communicate with Theo, but will this provide relief or just more pain? So, let’s talk about the ending. Some bizarre events start to occur towards the end of the novel which really confused me at first. But then there’s a fantastic twist that occurs right at the end of the novel – I definitely never saw that one coming! We finally learn the truth about what happened on the night of Gabriel’s murder, in the most astonishing way. I was so shocked! From then on, all the pieces of the puzzle finally fit together and everything starts to make sense. I was really happy with the ending, and felt that it tied everything together brilliantly. Overall, I highly recommend this novel to those of you who enjoy psychological thrillers, particularly those of you who are intrigued by the idea of a ‘silent’ protagonist or an unexplained murder. The book is a bit of a slow-burner at first, but soon enough you’ll be hooked! The ending was my favourite part of the novel, and my only criticism of the book would be that it was a little slow-going in the beginning. But the massive twist definitely made up for it! A highly recommended read for 2019.